Anoles form the largest genus of the Iguanidae with about 300 forms. They can vary their skin color between green and shades of brown and are sometimes called "American chameleons" although they are not related to the Old World chameleons. These variations in color are caused by the rearrangement of pigment cells in the skin in response to temperature, humidity, activity and emotional state. Seen in parks and residential areas on walls, fences, trees, and low bushes, green anoles reach a maximum length of six to eight inches. Their bodies are slender, with a long, thin tail. Like true chameleons, green anoles have the ability to change color; this ability is limited in anoles, however--coloration is usually green, yellow, brown, gray, or a mixture. 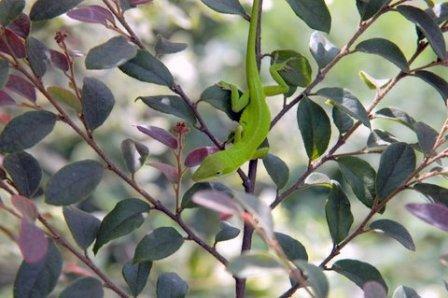 Most healthy, non-threatened anoles are bright green in appearance. The male anole has a large pink fan of skin on its neck, called a dewlap, which can be extended for courtship or territorial display. 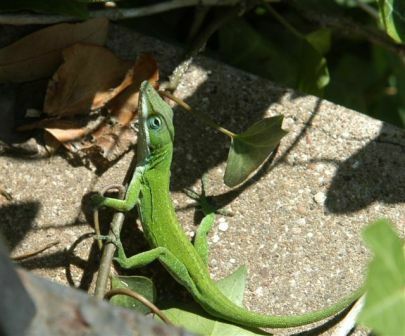 Anoles are diurnal - becoming active as soon as the sun warms its body. They feed on insects and spiders. In the wild they live only one to two years. They live up to three years in captivity, are highly territorial and have sticky feet. Anoles are almost perfect terrarium specimens. They require little room, do little damage to the plants in their cages and reproduce easily. The female buries eggs in a shallow hole in the ground.